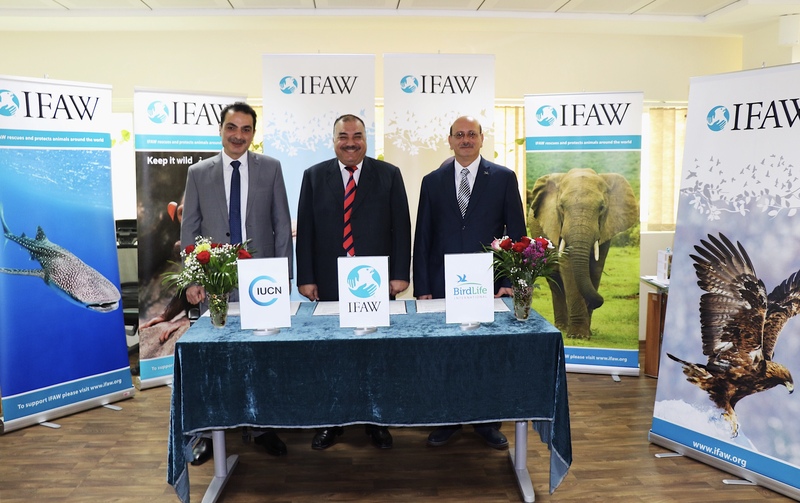 Dubai, UAE (January 10th, 2018) – the International Fund for Animal Welfare (IFAW), International Union for the Conservation of Nature (IUCN), and Birdlife International (BL) signed on the 10th of January 2018 at the IFAW MENA office based in Dubai, the agreement to cooperate in protecting the components of nature and wildlife ranging from species to populations of animals and birds, and their habitats and ecosystems, through the preparation and implementation of joint projects in the Middle East and North African countries. The aim of the Agreement is to establish a framework for partnership and cooperation; uniting efforts in the area of Biodiversity conservation in general to protect the endangered species of animals and birds, in regards to animal welfare. In addition, the agreement will stand as an awareness campaign that will first take place in Lebanon to combat the illegal hunting of birds and wildlife with the cooperation of the Lebanese Ministry of Education and the Lebanese Ministry of Environment. Exchange information and expertise in these areas. The Regional Directors in the MENA offices presented the three organizations; Dr. Elsayed Ahmed Mohamed, the Regional Director of IFAW based in Dubai, Mr. Fadi Al-Sharida, the Regional Director of IUCN based in Amman/Jordan, Mr. Ibrahim Khader, the Regional Director of International Birdlife based in Amman/Jordan. The duration of this convention is five years, renewable under tacit agreement.